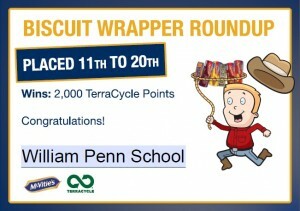 Together with the top 20 collectors on the McVitie’s Biscuit Wrapper Roundup, the William Penn Primary School with the help of Sussex Green Living and other competitors have saved over 47,000 Biscuit Wrappers from landfill! This, added to the collections of all other contest participants, means that over 105,000 Biscuit Wrappers were saved from landfill! Results of the William Penn School’s recycling……. This entry was posted in Eco School Sussex blogs, Eco School William Penn, Green stats, facts & news, Recycling facts. Bookmark the permalink.